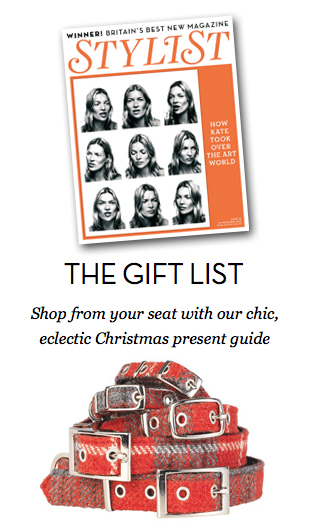 Stylist (Britain’s best new magazine) had a fantastic Christmas Gift Guide for 2010, compiled by Morag Paterson. After scouring the country for the most stylish, thoughtful and useful Christmas presents around Morag chose Love My Dog as the sole pet product. Needless to say, I was very happy that the new Red Tartan Harris Tweed dog collars made the list. They are available in sizes for all breeds and suitable all year round, but very fitting for Christmas in red! Get yours in the online shop.